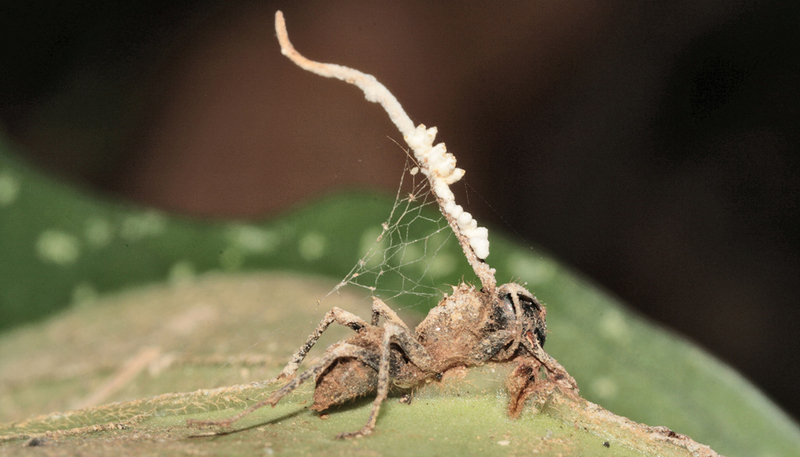 After the “zombie ant fungus” kills a victim, it grows a stalk called the stroma, which protrudes from the ant cadaver. A large round structure, the ascoma, forms on the stroma. Infectious spores then develop in the ascoma and are released onto the forest floor below, where they can infect foraging ants from the colony. 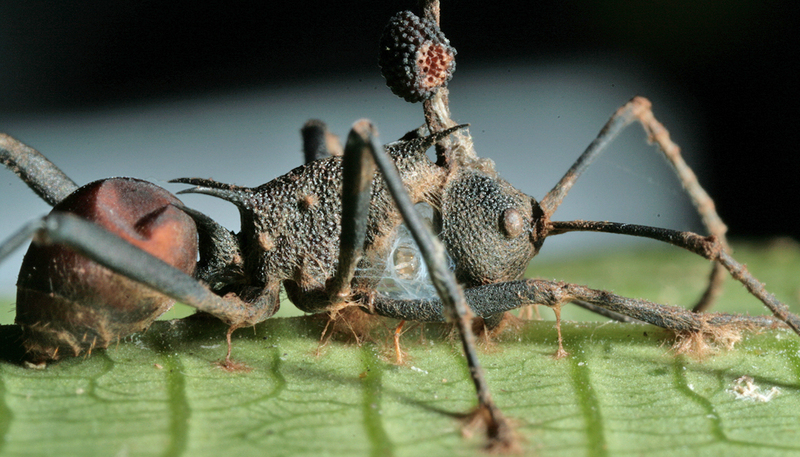 “After climbing vegetation and biting the veins or margins on the underside of leaves, infected ants die, remaining attached to the leaf postmortem, where they serve as a platform for fungal growth,” says lead author Raquel Loreto. 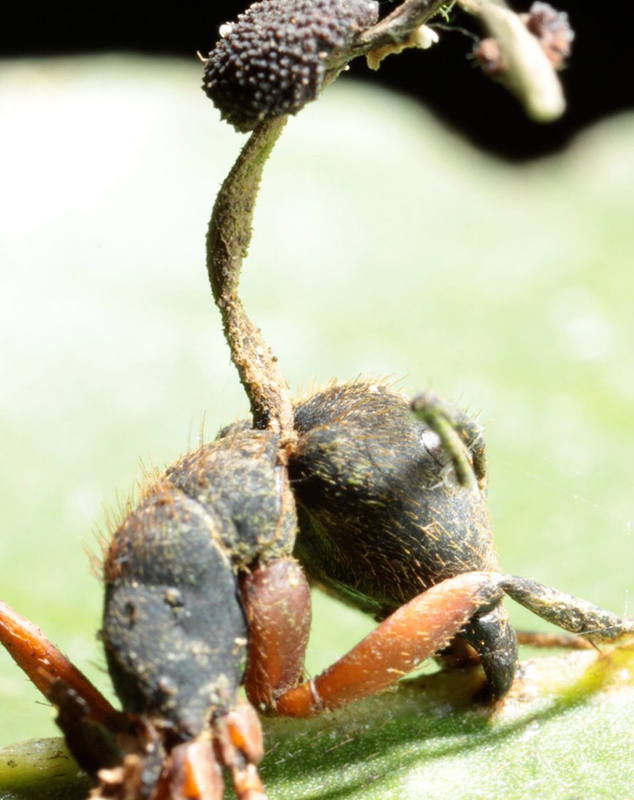 Previous research shows that the fungus, Ophiocordyceps camponoti-rufipedis, controls the behavior of carpenter ant workers—Camponotus rufipes—to die with precision, says Loreto, a doctoral candidate in entomology, Penn State’s College of Agricultural Sciences. 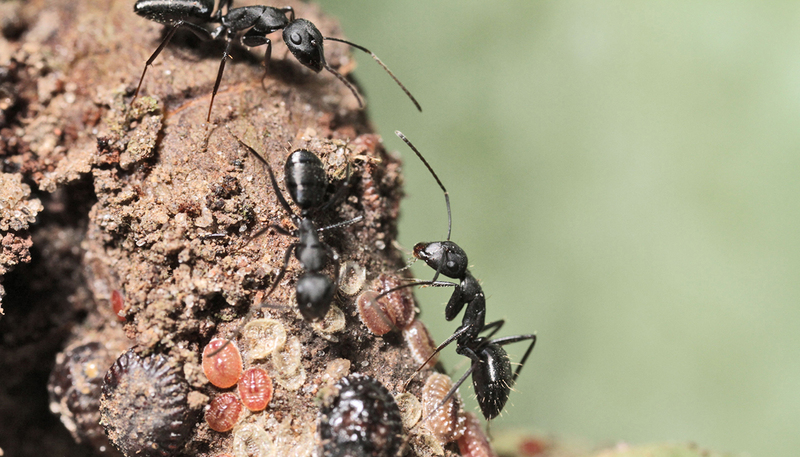 This fungal reproductive activity must take place outside the ant colony, in part because of the ants’ social immunity, which is collective action taken to limit disease spread, explains study coauthor David Hughes, assistant professor of entomology and biology. The researchers tested social immunity by placing 28 ants freshly killed by the fungus inside two nests—14 in a nest with live ants and 14 in one with no ants. They found that the fungus was not able to develop properly in any of the 28 cadavers. 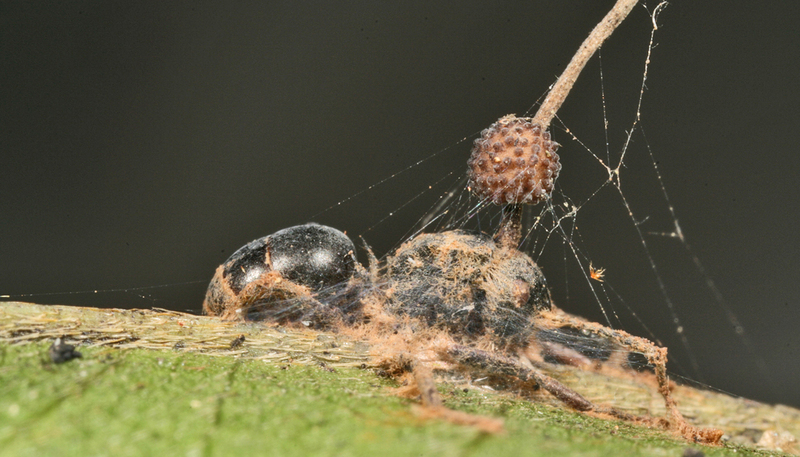 In the nest with live ants, nine of the 14 infected cadavers disappeared, presumably removed by the ants in an effort to thwart the disease organism. Next the researchers set out to record the prevalence of the fungus among ant colonies within the study area, which was located at the Mata do Paraíso research station in southeast Brazil. After marking and searching 22 transects covering a total of 44,000 square meters, they discovered that all 17 nests found had ant cadavers attached to leaves beside the colony, suggesting a fungal prevalence of 100 percent at the ant population level. In a more detailed, 20-month survey of four of those ant colonies, the scientists measured parasite pressure by mapping the precise locations of fungus-killed ants and foraging trails in close proximity to the nests. By measuring the position of manipulated ants and plotting these locations with respect to the nest, the researchers established that infected ants die on the “doorstep” of the colony. Despite the high prevalence of infected colonies and persistence of the fungus over time, the researchers did not observe colony collapse, suggesting that the parasite functions as a long-lasting but tolerable condition for the ants. The research findings appear in PLOS ONE. “We suggest that the parasite can be characterized as a ‘chronic disease’ that, as in humans, can be controlled but not cured,” Loreto says. CAPES-Brazil and Penn State supported the research. Can parasite ‘birth control’ fight malaria’s spread?